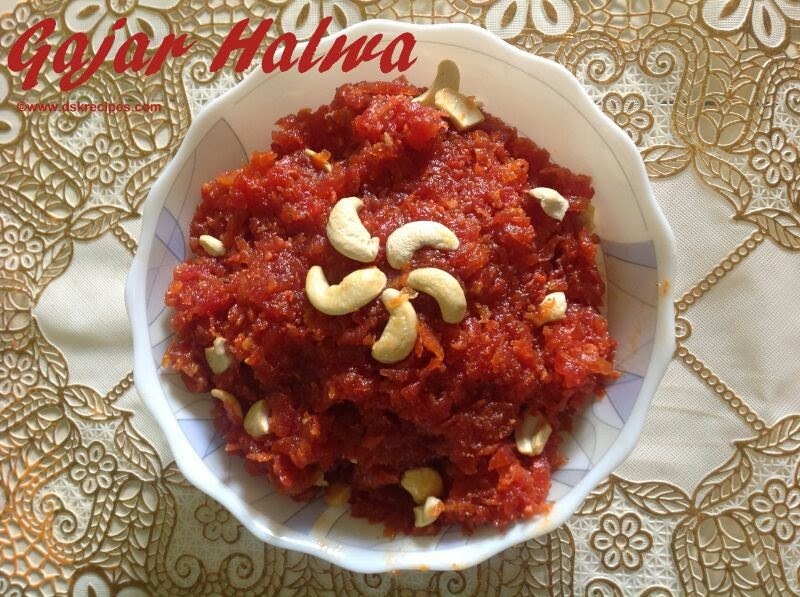 Gajar Halwa / Carrot Halwa is an Indian dessert. Its made from grated carrots cooked in sugar syrup. Its delicious to taste and easy to cook. 1. Heat a pan and add 2 tsp of ghee. 2. Now add the grated carrots / gajar into it and fry for few mins. 3. Next add sugar and milk in the pan. And mix them well with the carrot. 4. On a medium flame keep stirring the mixture to avoid burning. 5. Cook until the milk and sugar binds together well and water gets dried up completely. 6. It will take around an hour for the milk to evaporate completely. 7. Cut cashews into small pieces. Add cardamom powder and few pieces of cashew into the mixture. Stir well and cook again for around 2 mins before switching off the flame. 8. Garnish the halwa with left over cashews and serve! Thanks to Shruti Kulkarni for sharing the recipe.